Unlike high-speed trains, Hyperloop pods will travel through tubes with most of the air pumped out, without being slowed by air resistance or friction, potentially creating a zero-traffic, zero-auto accident environment. How would you like to ride from Pueblo to Denver and even Cheyenne, Wyo., at nearly 500 mph, with zero traffic and zero chance of a car accident? What about getting from Denver to Vail or Fort Collins in nine minutes? Denver to Greeley in six minutes? That day may be coming, sooner now. 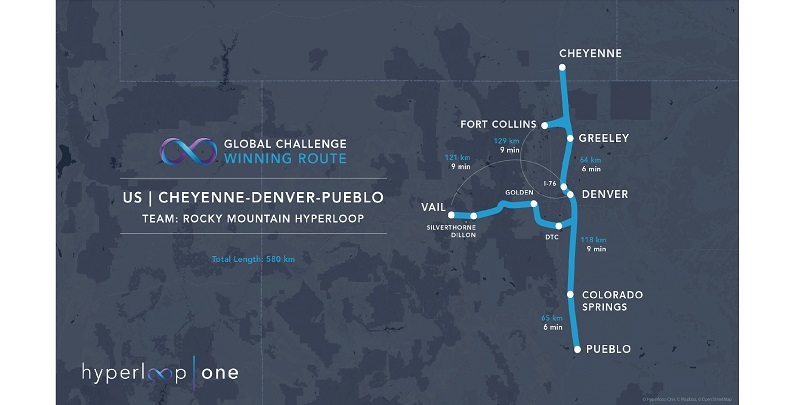 The Hyperloop One organization has chosen Colorado as one of 10 regions in the world to develop plans for this kind of futuristic transit system. If the 580-mile Rocky Mountain Hyperloop line is built, it will connect cities across the region with a system of elevated and subterranean tubes. Pods, loaded with passengers and cargo, are pulled by an electric propulsion system. They float on a maglev track and gradually build their incredible speed through the tube. Unlike existing high-speed trains, the pods aren’t slowed by air resistance or friction because the tubes have been pumped nearly devoid of air. Hyperloop is the stuff of science fiction writers and dreamers like Tesla founder Elon Musk. It opens the doors to new possibilities and makes old ways seem dreary. Think commercial jets over passenger trains, sports cars over horse-drawn carriages. Get ready for the future. But it won’t happen on its own. That’s where Hyperloop One comes in. The organization, which has built a working Hyperloop prototype, sponsored a global challenge to find the 10 strongest new routes for these systems in the world. The organization will contribute significant business and engineering resources to the Colorado project to determine its commercial viability. The Colorado Department of Transportation and AECOM, the international builder of infrastructures such as bridges, stadiums, and subways, will start determining where and how the system’s tube should be suspended, placed at ground level, or buried underground. AECOM hopes to complete three Hyperloop systems by 2021. A 480-mile Midwest connection between Chicago, Columbus, Ohio, and Pittsburgh. A 640-mile triangle connecting Dallas, Houston, and Laredo, Texas. A 257-mile route connecting Miami and Orlando, Florida. Ultimately, the Hyperloop consortium hopes to build a “Hypernet” network of systems that will connect the entire United States. The project closely follows CDOT’s plans to improve travel and safety in the state. The agency created its RoadX office to encourage transportation development that will ease traffic congestion and increase safety.